1. Their Coach Is Not In A Wheelchair. After years of coaching at Illinois, coach Lou Henson retired after the 1995-96 season, to much fanfare. (He even shook hands with Bobby Knight, the big bully.) 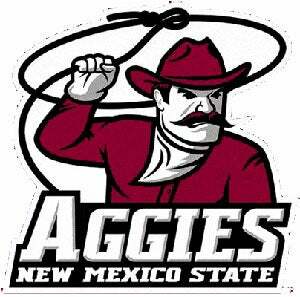 But he ended up taking only one year off before returning to New Mexico State, where he had taken the Aggies to the Final Four in 1970, for yet another farewell tour at a salary of $1 a month. Henson stayed there for seven years before retiring again because of his diagnosis of non-Hodgkins lymphoma, a disease that had him coaching two games from a wheelchair. He is the all-time winningest coach at both NMSU and Illinois. 2. The New Coach Is Much More Handsome Than Lou Henson. The Lou Do was succeeded at NSMU by current coach Reggie Theus, the former NBA star perhaps most famous for his performance as coach Bill Fuller on the cutting-edge sitcom "Hang Time." My personal favorite act of Theus thespianism, however, is his work alongside Joe Piscopo and Julie Hagerty in the 2000 family comedy "Baby Bedlam," playing "Mosiah 'The Messiah' Jackson."